The escape of three circus elephants from the Moolah Shrine Circus in St. Charles, Missouri, on Saturday March 22nd 2014 demonstrates the terrible risks to which circuses with wild animals subject the public, staff and the animals. The elephants reportedly escaped from the area of the circus offering children’s rides and damaged the venue’s loading door before rampaging through the Family Arena parking lot and damaging a number of vehicles. An eyewitness reported the elephants were “breaking mirrors off, pulling panels off, breaking the windows out” of vehicles as they ran through the lot. Seeing the severe damage done shows how powerful these animals are. If the elephants were being used for children’s rides at the time, the consequences might have been tragic. Last year at the same venue, the Moolah Shrine Circus (performing as Royal Hanneford Circus) featured the Hall’s Bears act which ADI exposed last September revealing how the bears routinely have muzzles strapped around their mouths, are made to dance and perform demeaning tricks, and spend around 90% of their time caged in tiny cells in their transporter. Using wild animals in circus acts has declined in popularity worldwide as the public and policy makers become aware of the inherent suffering caused to the animals, in addition to the public safety risks such acts pose. Twenty-five countries around the world now have national restrictions on the use of performing animals in place, with several more under discussion. 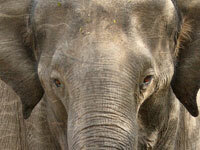 Last year, ADI launched a campaign against elephant rides at county fairs and other events. In the DVD “No Fun for Elephants,” narrated by Emmy award winning TV host Bob Barker, ADI documents elephants being beaten and electric shocked during training and handling, behind the scenes. The same trainers are then shown controlling the elephants as they give rides and make appearances at parades. As a result of the campaign elephant rides have ended at: Bristol Renaissance Faire, Grays Harbor County Fair, Jaycees Gregg County Fair, Lake Renaissance Festival, Upland Lemon Festival, Los Angeles County Fair, Orange County Fair, Fountain Valley Easter event, Santa Ana Zoo and the Sierra Madre Independence Day parade.